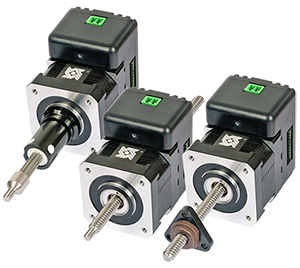 The 43000 Series Size 17 Double Stack Single Stack Hybrid Linear Actuators with integrated IDEA™ Drive is available in a wide variety of resolutions – from 0.000625-in (.0158 mm) per step to 0.005-in (.127 mm) per step. Delivers output force of up to 75 lbs (337N). Available in captive, non-captive and external linear. The IDEA™ Drive software with on-screen buttons and easy-to-understand programming guides, generates motion profiles directly into the system and also contains a “debug” utility allowing lineby-line execution of a motion program for easy troubleshooting. ** Contact Haydon Kerk if a higher voltage motor is desired. Up to 10-in (254 mm) standard screw lengths. Longer screw lengths are available. NOTE: All chopper drive curves were created with a 5 volt motor and a 40 volt power supply. Ramping can increase the performance of a motor either by increasing the top speed or getting a heavier load accelerated up to speed faster. Also, deceleration can be used to stop the motor without overshoot. With L/R drives peak force and speeds are reduced, using a unipolar drive will yield a further 30% force reduction. Haydon offers a wide selection of greases designed to meet any application requirements. Please contact Haydon Kerk Motion Solutions for assistance in selecting the most effective lubrication option. is a light viscosity, polyolester based grease thickened with PTFE. It is an economical alternative to premium PFPE (perfluoropolyether) types where low temperature performance is a primary requirement as it provides low starting torque. is a medium viscosity synthetic hydrocarbon grease thickened with lithium soap. It is fortified with EP (extreme pressure) modifiers to increase load carrying capabilities and TFE to increase lubricity and reduce friction. Rated temperature capacity is -20°C to +125°C. HSS-17 has the highest load characteristics. is a TFE thickened heavy viscosity perfluoropolyether grease. It is designed to operate in chemically harsh environments and provides excellent operating properties for light to medium loads. Rated temperature capacity is -65°C to +250°C. Standard on Hybrid Actuators. is a perfluoropolyether grease developed for use in vacuum environments good to 4x10–13 torr at 20°C. Rated temperature capacity is -80°C to +204°C. is an ultrafiltered version of HSS-06, meaning that the grease it put through a ‘cleaning’ process to remove any particles greater than 35 microns in size. It is designed for use when accuracy and repeatability are of utmost concern. Black Ice and Kerkote TFE coatings are available in some of our actuator designs depending on the nut polymer used. Please consult the applications engineering team to discuss lead screw nut / TFE coating compatibility.